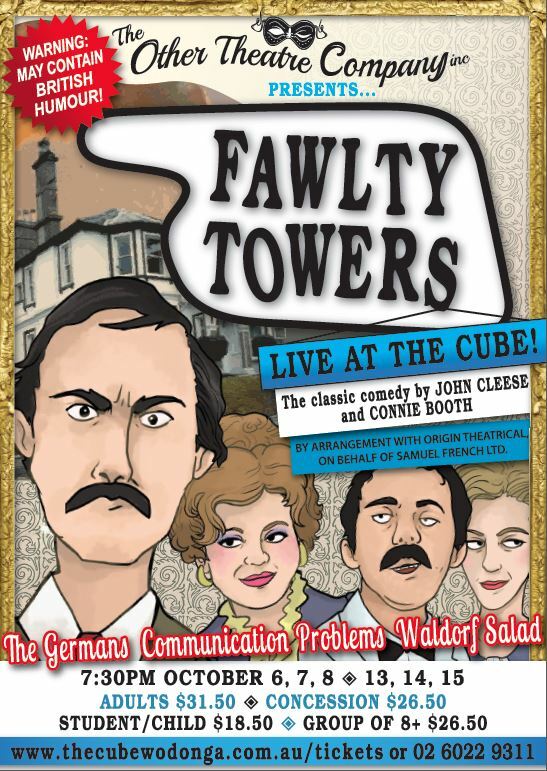 First presented on British TV in 1975, with a second series appearing in 1979, written by former Monty Python’s Flying Circus performers John Cleese with Connie Booth, the show has remained one of the most popular English TV comedy series of all time. Witness the antics of the “ageing, brilliantine stick-insect,” possibly the World’s worst Hotel owner, Basil Fawlty, as he rails against the inconvenience of paying guests, competent staff, the language barrier and Sybil, in three of the best episodes from this Classic TV series. Diplomacy is Basil’s middle name as he strives to meet his self-imposed directive, “don’t mention the war,” in The Germans. How will Basil ever cope with a deaf guest who refuses to turn on her hearing aid in Communication Problems? And discover Basil’s culinary skills (if he can ever track down the elusive Waldorf) and watch helplessly as he clashes with a formidable American in Waldorf Salad. Add to the mix Sybil – Basil’s “overbearing” wife; Polly the conscientious University-student housemaid; and Manuel, a waiter whose grasp on the English language would be smoother if he simply grabbed a live tiger by the tail; and you have all the necessary ingredients for a hilarious evening’s entertainment! It’s always been part of my life. I remember, as a child, rolling around on the floor laughing at Fawlty Towers. I know this sounds like an exaggeration but I swear it’s true. A Fawlty episode on TV once brought me out of an otherwise impenetrable sulk on a family holiday to a caravan park. My future in-laws allegedly decided to allow me into the family when I called their daughter ‘my little nest of vipers’ the fiest time I met them. So logically, when the opportunity arose to bring the brightest shining jewel in the crown of British comedy to the stage, I leapt at it faster than a bat up a nightdress. Nnow with this truly fantastic cast and crew (seriously, I love you all), it’s time to show you what we’ve got, and I think it’s something special.